We are located 15 minutes from Owen Sound, 20 minutes from the town of Meaford, or 40 minutes from Collingwood. Serenity is located in a beautiful area with lots to offer. We encourage our guests to explore the Grey Bruce trail systems—perhaps an afternoon excursion by mountain bike, snow shoe, or canoe. We offer equipment for all of these activities for our guests. Blue Mountain offers activities both in the winter and summer. Voted one of the Top 20 golf resorts in canada by Links Magazine. Located just south of Owen Sound in the beautiful Georgian Bay area, nestled along million-year-old limestone cliffs, Stone Tree stands tall among Southern Ontario's finest golf courses. Situated on 25 acres of natural Ontario birch, Canadian maple and pine trees, the Spa has expansive views of the UNESCO World Biosphere Reserve Niagara Escarpment. Located within minutes of Ontario’s number one ski destination, guests can soak in the Baths and watch Blue Mountain Resort skiers curve down the slopes under the lights in the winter months. In the warm months, guests are within a short drive to the world's longest fresh water beach, Wasaga Beach as well as the impressive shoreline of Georgian Bay. Escape and treat yourself to a pamper package at The Spa at Cobble Beach. Massages, body treatments, facial treatments, day packages, men's packages and more are all offered at Cobble Beach Spa. 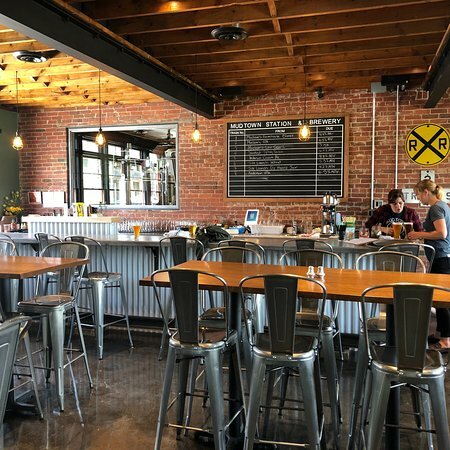 Mudtown Station Brewery and Restaurant offers a fun meeting place in the east harbour of Owen Sound that celebrates both the history of the city and the talents of our present-day residents. Food produced locally paired with the best our area has to offer in craft beer sets the stage for a great time. Come and experience a wide variety of craft beers prepared on site in our brewery by Morag plus guest taps from other local brewers. Paired with a menu featuring locally sourced ingredients and prepared by Tyler the kitchen, we offer you a unique dinning experience in Owen Sound. Celebrate with us the past but enjoy the present – great beer, great food and a great view from the patio. A short 5 minute drive (20 minute bike ride), Coffin Ridge is a hidden gem worth a visit. Overlooking the crystal blue water of Georgian Bay, in the shadow of the Niagara Escarpment sits Grey County's first winery, Coffin Ridge. A boutique winery by design, Coffin Ridge produces high quality, small batch wine made primarily from grapes grown from hand planted, hand picked Grey County grapes. Coffin Ridge's three signature wines: Into The Light White, Back From The Dead Red and Resurrection Rose express the Grey County terroir exquisitely. Start your day at Coffin Ridge with a wine tasting led by our knowledgeable staff. From there you can retreat to the deck for a glass of wine and our vintner's plate made up of local artisan breads and cheeses which have been specifically paired with the glass of wine you are drinking. Relax, listen to music and enjoy the Coffin Ridge experience. For a slightly more casual experience with equally good food of both the standard fare as well as classic Greek cuisine, visit Shorty's in downtown Owen Sound. Also, favourably reviewed on tripadvisor. Enjoy fine cuisine and incredible views at the Sweetwater Bar and Grill. Rated highly on tripadvisor. We are very fortunate to be at the very center of activity in Harrison Park. As a full season park, it offers opportunities to relax in a park setting, hike along the trails, visit the bird sanctuary, and more! With Biking, Walking, Paddling, Mini Golf, a large playground, experiential music makers, and a large trail system at your fingertips, there is so very much to do here at Harrison Park. And that is just the summer! In the winter, there is snowshoeing, cross county skiing, and of course crisp winter air morning walks in the sun kissed brilliant white snow. After all of that excitement, or before heading out, you should consider visiting us for some of our great food and great service. The gentle flow of the Beaver River, navigable from Kimberley to Heathcote, is a perfect place for beginners. Named for the many Beaver found along its 40 kilometres, this river was used as a transportation route during the 19th century. Three sections on the Beaver feature rugged scenery, wildlife including great blue heron, great horned owl, white-tailed deer and of course the beaver, as well as angling opportunities. Distances range from 6 kilometres to 15 kilometres. Access is available at Grey Road 13 north of Kimberley, Epping side road and at Heathcote. Beaver Valley is part of the Bruce Trail. One of the 9 sections of the Bruce Trail, the Beaver Valley section extends from Craigleith to Blantyre covering, 113.1 km of main trail plus an additional 25 km of side trails. It takes hikers across diverse landscapes from the top of the escarpment with grand views of Nottawasaga Bay and of the Beaver Valley, through fields and forests, by creeks and waterfalls accompanied by the flora of the different seasons or the colourful foliage of fall. This is a section of Bruce Trail like no other. The terrain changes abruptly as the Trail enters the area best known for Ontario's ski resorts. The Trail in this section is set among high bluffs interspersed with deep, wide valleys. From the Trail, the expansive views of the rolling countryside and the Nottawasaga Bay are lovely. The Brant Tract is a multi-use, year round trail system officially opened in 2002. This 781-acre property consists of approximately 25 kilometres of trail. These trails range from single-track, double-track to roadways suitable for all levels. The best single-track in Bruce County. These soil and gravel based trails provide excellent riding conditions that are dry virtually all season long. You are able to ride according to personal skill levels, which makes this track great for beginners and seasoned riders. Bruce and Grey Counties have a multitude of trail experiences available, from snowmobile trails, bike paths and walking trails along the Lake Huron and Georgian Bay shorelines, through unique habitats of the Bruce Peninsula, to inland forests and waterways of Saugeen Country and the Beaver Valley. Encompassing 116 hectares of Niagara Escarpment land, the property features scenic Jones Falls. Cascading 12 meters over the escarpment, the Pottawatomi River eventually makes its way to Owen Sound Bay on Georgian Bay. Following a picnic, the km trails lead the hiker to a vantage point providing a breathtaking vista of the surrounding lowlands and Jones Falls. You can join and follow the Bruce Trail further along the brow of the escarpment, or hike/ski the alternate trail system provided. This site contains various trees and shrubs ranging from Wild Rose to hard maples. Great white trillium and columbine are among the wildflowers that can be found. Cliff Swallows, Pileated woodpeckers, porcupines and woodchucks are common to the conservation area, as are garter snakes and painted turtles. The Sydenham River, below the escarpment, possesses ideal conditions for migrating fish and other aquatic species. Rainbow trout and Chinook salmon use this area as spawning grounds, and Brown trout often feed. Located just north of Wiarton on Bruce Road 9, the Mountain Bike Adventure Park brings you over 20km of single tract and double track trails. Local riders consider it to be one of the toughest tracks in the region because of its numerous rock outcrops and challenging inclines. Need some speed? The PUMP TRACT is a continuous loop of packed dirt that can be ridden on a bike without pedaling. The track contains a series of rollers and berms that allow the rider to gain momentum. Check it out! The closest cross country ski trails to the cottage are to be found at the Owen Sound Cross Country Ski Club. It's less than 15 minutes away, and you don't need to be a member to participate (non-members can put $5 in their drop-box). The Grey Bruce has some of the best snowmobile trails Ontario has to offer. Serenity cottage is a quick 5 minute snowmobile ride to this trail system. For reference, we are approximately 8 km west of Leith. Rental operations are located in both Durham (https://www.homesteadresort.ca/snowmobile.html 519-369-3771) and Collingwood ( https://www.rideonrentals.com/winter.html 705-293-0552). Both operations can arrange delivery to the cottage if desired.